Mother nature must have known I needed new material. The skies were interesting this weekend so I headed out to Sedgwick County Park in Wichita. One of my favorite spots near the windmill was not working, the sunset was directly behind a big old ugly transmitter tower. As sometimes happens, this turned out to be a fortunate turn of events as it forced me to find a new, better location from which to admire this handsome sunset. This entry was posted on August 20, 2012 by Charles Ford. 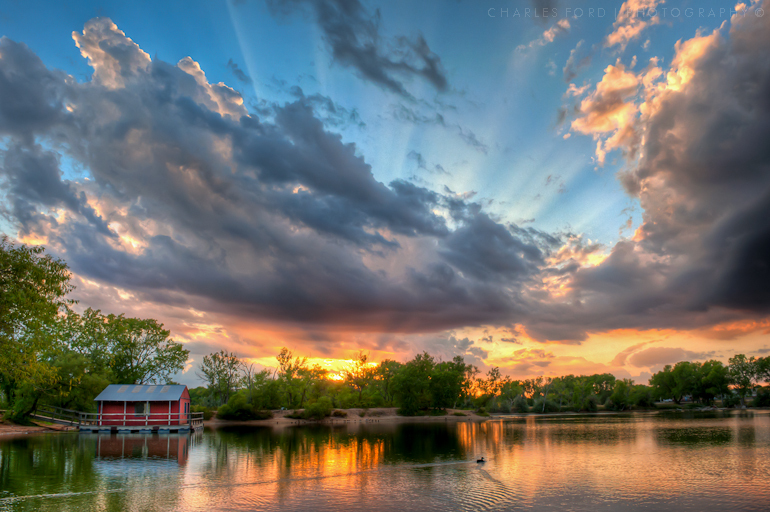 It was filed under HDR and was tagged with dock, Duck, Dusk, HDR, Lake, Photography, Sedgwick County Park, Sky, Sunset, Weather, Wichita. I am such a sucker for sunsets but I have to admit I haven’t shot anything nearly as good as this in a very long time. Atmospheric conditions have not been favorable for decent sunsets, at least in this area. This is particularly nice because the trail of the rippled water left behind the duck leads the eye into the photo and echos the clouds in the sky. Now you have two great location for sunsets! Thanks Ken. The ducks where actually not very cooperative, this was the best one of those that included a duck. Got some images without ducks as well. If they would learn to follow direction better, I might use them more often. I have not found a way to get ducks to cooperate but that doesn’t keep me from trying. If I find a way I’ll pass it on.